Come on, admit it. You’re a bit bored of Christmas cake, you’re not any keener on Christmas pudding and nobody could ever say they’re a big fan of the inevitable last minute trifle that emerges out the fridge as the only other choice of dessert. Luckily, we have the perfect solution: Christmas cupcakes! You can still get the taste of Christmas but in a smaller, prettier, individual serving. And if you’re not too handy with a mixing bowl, you could always ask for some lessons for Christmas. 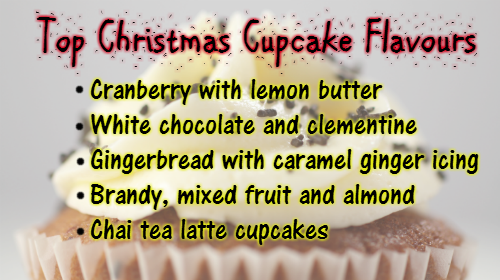 So without further ado, here are some of our favourite festive flavour suggestions and a cupcake recipe to try. 2. In one bowl, mix together egg, oil, milk and sugar and beat. 3. In a separate bowl, add the flour, cinnamon and baking powder to your grated carrots, apples and raisins. 4. Pour the flour mixture in to the egg mix and fold in, making sure everything is thoroughly combined. The mix will look fairly unappetising at this point BUT trust me it will taste good! 5. Evenly split the mixture between the cupcake cases and put them in the oven. 6. Let the cakes bake for about 20 minutes, or until a toothpick inserted through the centre comes out clean. 7. Once cooked, let the cakes cool whilst you make your icing. 8. For the icing, add the icing sugar to the butter and cream together before adding the apple juice. 9. When the cakes have completely cooled, spread the apple butter icing thickly and evenly on top of each cupcake before decorating with a sprinkle of cinnamon. Perfect for an afternoon snack, whilst doing a spot of present wrapping or even as the finale for Christmas Day dinner! If you try them, let us know what you think below. You can also see all our food and cookery courses over on the Red Letter Days website.